Tom Bodett would not be happy with Brainerd, Minn. 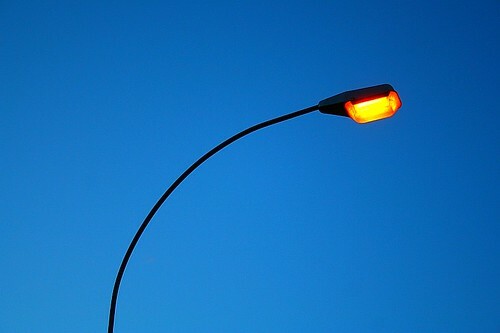 The City Council there voted to keep about a quarter of the city’s 1,600 street lights dark, despite complaints from many residents. The city would save $74,100 a year by keeping the lights off, according to a city official. Council members who toured the city on June 29 and June 30 with [Brainerd Public Utilities] officials said they found several areas where lights can be turned back on. In 2009 Northfield, Minn. looked at adding a streetlight utility fee (pdf) to help address smaller amounts of local government aid from the state. Other cities across the country have also flipped off the switch on their street ights, according to USA Today. “Streetlights are more expensive than people realize,” Northfield Mayor Mary Rossing says. Her city spends about $230,000 a year on street lights. Would you mind if your city turned off your street lights to save money? Brainerd and Northfield are not the only Minnesota city looking for ways to trim expenses. The Royalton City Council voted to reduce the number of its meetings to once a month (having met twice a month for more than 30 years). That would save about $5,600 a year, according to council members. But so far, nothing I’ve found has topped Edina’s cost-saving effort of ending its free doggie-bag program — which cost about $12,000 a year. What has your city done to save money recently? Actually, the one street light on my Roseville street was out for a couple of months earlier this spring…I noticed it was out because it is near my house and I was working into the evenings. I don’t know what took so long to replace it but I’m guessing no one complained about it. We could probably get by without it. A lot of residents have outdoor lighting on their homes and yard lights in the back, probably makes a difference. Only the worst of the worst potholes are getting attention here in my ‘burb. And hot mix has been replaced by cold mix–which disappears down the storm sewer after heavy rainfall. In my decaying mill town hometown, the mayor ordered all of the streetlights turned off. This is one of those cities where once you get out of downtown, things get dark when you turn out the streetlights. My mother’s home has been broken into — at night, once while she was sleeping — twice since then. Turn them off. All of them. What a waste of resources. Our alley in St Paul is an “unimproved” alley. That means when the downpours came this weekend it turned into a small stream. The neighborhood watch captain coordinated the installation on two street lights in the alley. Since it is unimproved the city doesn’t provide them. We pay Xcel directly for their operation. The watch captain collects the money and pays it out. Every 12-18 months he comes back around to refill the reserve. This is not a straight through alley so it helps to have one light at the corner and one midway down the long part of the alley.